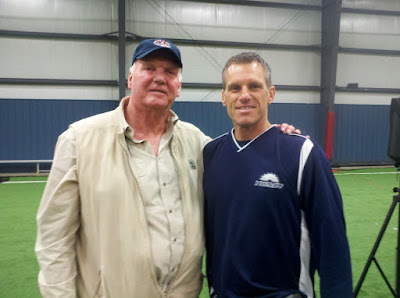 I was invited to a coaches clinic where the keynote speaker was Charlie Manuel and I was excited to attend because I knew that it would be an intimate setting where I would probably have an opportunity to talk to him and try and learn from him. As many of you know, Charlie Manuel was the former hitting coach and manager of the Cleveland Indians. While he was there, he coached star players such as Albert Belle, Carlos Baerga, Robby Alomar, Manny Ramirez, Sandy Alomar, Kenny Lofton, Jim Thome, Omar Vizquel and more. There are at least two or three hall of famers in this list. Now he is the manager for the Philadelphia Philles where he won a World Series few years ago and coaches some of the best players in the game such as Chase Utley, Jimmy Rollins, Ryan Howard, Cliff Lee, Roy Halladay and more. Our own catching instructor, Paul Hoover, played for Charlie Manuel in 2009 and 2010. As I had hoped, I was able to listen to Charlie talk about baseball, managing, hitting and tell some stories for about three hours. I wanted to highlight some of the things he talked about so that young players can hear directly from a major league manager some of the lessons that I think he was trying to convey. Listed below are some of the key points that I wrote down, in no particular order. Attention to detail - Charlie repeated this concept many times over the three hours. One of his favorite saying is "little things mean a lot". He said this when referring to hitting, to throwing runners out a second base, to catching signs from the third base coach etc. "Gotta want it" - He said that in order to be successful, the player has "gotta want it". I also took from it that proof that the player wants it is that they are willing to work harder than anyone else. He said that when he was a minor league player, he took batting practice for "at least an hour per day, sometimes two hours". Charlie talked a lot about mental toughness and "earning playing time". He talked about how guys who earn their playing time are better than the ones who are given playing time. Charlie had a turning point during his professional career where a coach challenged him to "be as good in games as he was in practice". The coach challenged him by telling him not to come back unless he really wanted to be there. Charlie said that after that day, he was "more relaxed, more focused and more prepared" each game which led to him putting up outstanding statistics over the remainder of his playing career. Charlie talked about how to play winning baseball. He said "executing the game and playing situational baseball comes first". He then went on to give examples about moving runners and good baserunning. He said, for example, that if you are a left handed hitter with a runner on second base, all you have to do is pull the ball to the right side. He said hitting a grounder to the second baseman is good but hitting a home run is even better. Either way, you have to execute. 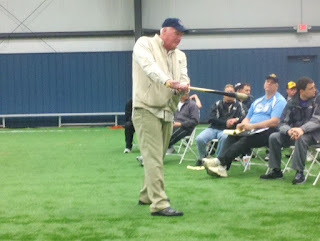 Charlie gave his top three most important tips when it comes to hitting: First, get a good ball to hit. He talked about conversations he had with Ted Williams and I know that Ted Williams wrote about this in his book The science of hitting. Secondly, be prepared. He talked about practicing an hour per day and he also talked about observing pitchers and being able to remember how the pitcher might have pitched you in the past. He gave an example of a time when there was twelve years between seeing a particular pitcher and remembering what the pitcher threw him last time. He joked about how Albert Belle used to keep a notebook about each pitcher but that he would just remember. He said 'isn't it smarter to remember than to have it in a notebook somewhere'? Third, "quick bat = slow feet, quick hands". He talked about how the best way to have quick hands is to make sure the hands are taking the shortest distance to the ball. He said that the best way to get your timing is by playing in games and mentioned that he used to like to get 80-100 at bats during spring training to get his timing down. I found it interesting that he talked more about his playing days than he did his managing days. I think that's probably how he manages his players. He said that he tries not to talk about mechanics with a player during the season if he can avoid it. He'd rather talk about a better approach. He said that if a players is doing something mechanically wrong, he will wait until the player goes into a slump to mention it. He went into detail about Jim Thome and Manny Ramirez's swings and compared them a bit which I thought was very interesting. There was much more that was discussed over three hours. The good news is that there was nothing that he talked about that in any way contradicts what we are teaching at Play Ball Sports Academy. As a matter of fact, mostly, it re-enforced what we are teaching in addition to reminding us of some of the most important principles. I think the big thing that I took from my time with Charlie is that a "players best hitting coach needs to be himself". Players need to become students of the game and practice harder and smarter than anyone else. That has always been the best way to become great at something and I don't think that will ever change. Disclaimer: I wrote this article from my notes and transcribed them as accurately as I could. Some of the quotes may not have been exactly as he said it so I do not want anyone to attribute anything I said here as a direct quote. This information is for the benefit of the players that come to Play Ball Sports Academy and is not meant as anything more than my recollection of what was said. I did not ask permission from Charlie to publish this information but I don't think he will object to the information that is presented here.